Azure has announced that from June 30th 2018 they are retiring support for Service Management API (which indicates Cloud Services). Azure has stated that "Cloud Services is similar to Service Fabric in degree of control versus ease of use, but it’s now a legacy service and Service Fabric is recommended for new development" (source). This guide covers everything you need to know to do your first Azure Cloud Service deployment. There are several core concepts involved in deploying Azure Web Apps. Read on for more information. In order to deploy Cloud Services they must be packaged into the Cloud Service .cspkg format and then packaged inside an Octopus compatible NuGet package. 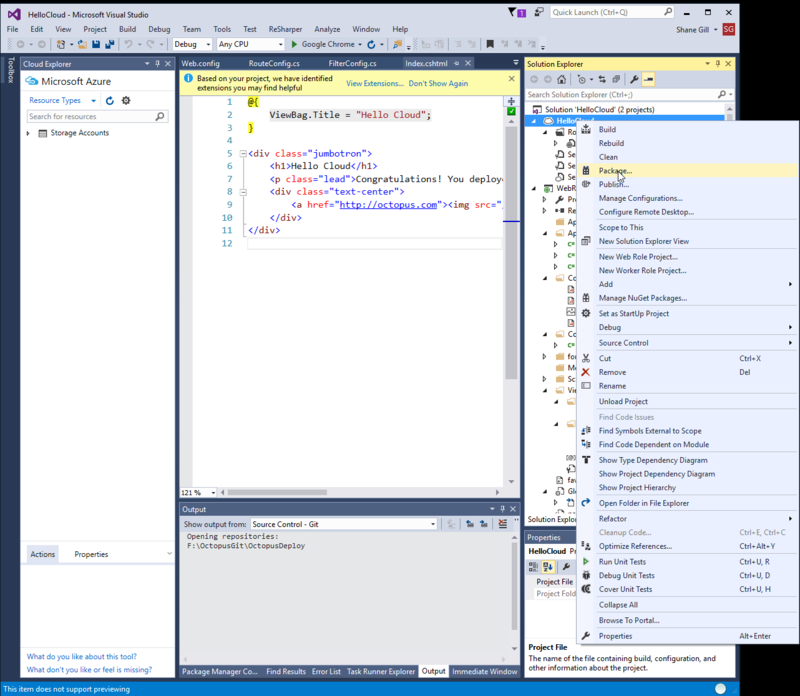 Packaging into a .cspkg can be done in Visual Studio by right-clicking on the Cloud Service and selecting "Package...". This action with generate a .cspkg and .cscfg file which can be deployed to Azure Cloud Services. To set up a new Azure Management Certificate account, follow the directions in Creating an Azure Management Certificate Account. 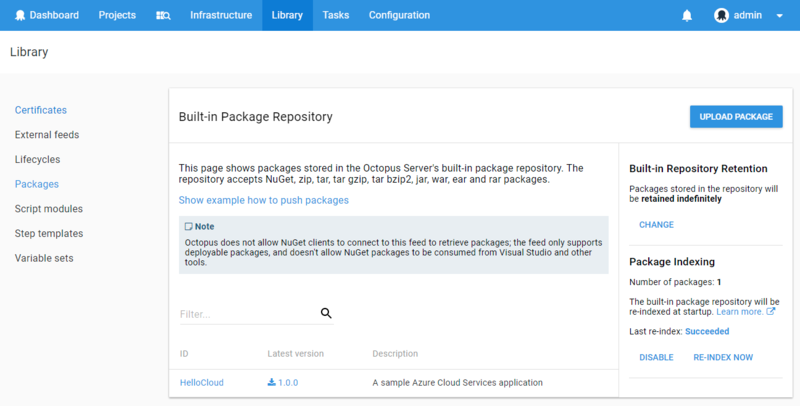 Octopus Deploy supports deployment of Azure Cloud Services. Note that the below deployment step was added in 3.1 and is not available in 3.0. Add a new "Deploy an Azure Cloud Service" step to your project. For information about adding a step to the deployment process, see the add step section. Select the account that Octopus will use to deploy the Cloud Service. The 'Cloud service' and 'Storage account' fields will list the Cloud Services and Storage Accounts available to the Azure subscription associated with the chosen Account. Refer to the Azure documentation for instructions on creating a Cloud Service and Storage Account. You can choose to deploy to either the Staging or Production slots. Swap staging to production if possible. If 'Always deploy' is select, the package will always be deployed to the selected Slot. If 'Swap staging to production if possible' is selected and the selected Slot is Production, then a swap will occur between Production and Staging (if there is a deployment in the Staging slot). See VIP Swap for more information on how to configure a VIP swap. 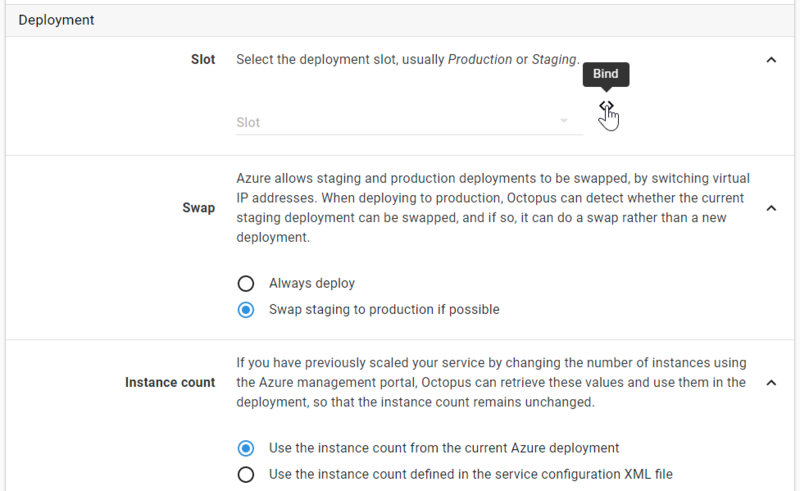 If you have scaled your Windows Azure service using the management portal (for example, changing the role count from 1 to 4), during a deployment Octopus can be configured to keep the existing instance counts rather than using the instance counts defined in your cloud service configuration file. Download the NuGet package from the NuGet server. Extract the NuGet package on the Octopus Server to a temporary location. Extract the Cloud Service package (.cspkg) to a temporary location. Any configured or packaged PreDeploy scripts are executed. Variable substitutions in Cloud Service configuration file (.cscfg). Substitute variables in files (if configured). XML configuration transformations (if configured) are performed. XML configuration variables (if configured) are replaced. Any configured or package Deploy scripts are executed. Re-package the Cloud Service Package. Upload the Cloud Service Package to Azure Storage. 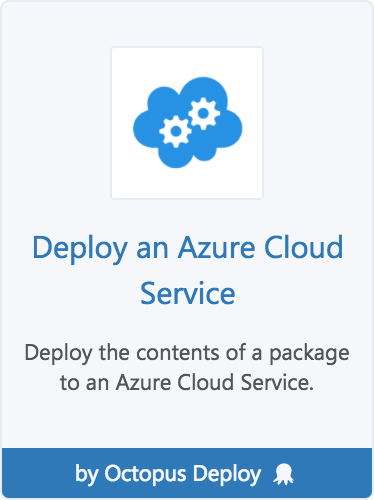 Deploy the Cloud Service Package (see 'Customizing the deployment process' section below). Any configured or packaged PostDeploy scripts are executed. Cloud Service Package files are extracted during deployment, in order to make available features such as Configuration Transforms and Variable Substitution. 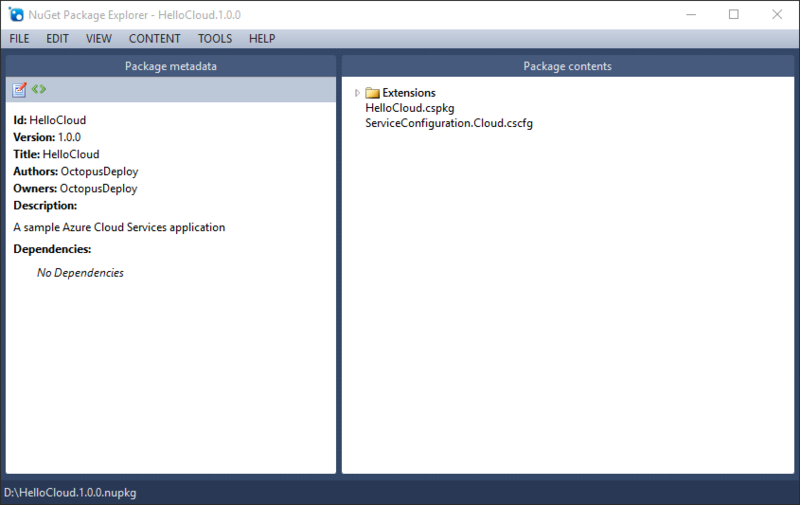 To extract the Cloud Service Package, it is first converted to the CTP format (also known as V20120315). This is the format described by Microsoft documentation, but is not used by default by the CSPack utility (passing the /useCtpPackageFormat switch is required for this format to be used). This is just an implementation detail, but the documented archive layout gives a good starting point to understanding the layout of the extracted package. Setting the Octopus.Action.Azure.LogExtractedCspkg variable to true will cause the layout of the extracted package to be written into the Task Log. This may assist with finding the path to a particular file. If a variable named HelloMessage is defined in your Octopus project variables, Octopus will automatically update it in the configuration file. You can also name the variable Humpty.Worker/HelloMessage to scope the setting to a specific web/worker role. The deployment is performed using a PowerShell script called DeployToAzure.ps1. If a file with this name exists within your NuGet package, Octopus will invoke it. Otherwise, Octopus will use a bundled version of the script as a default. You can view the bundled script here, and use it as a basis for creating your own custom deployment script. PowerShell executed against an Azure Cloud Service target will have the Azure PowerShell module loaded, and the subscription from the chosen account will be selected.